Food safety is a matter of intense public concern, and for good reason. Millions of annual cases of food “poisonings” raise alarm not only about the food served in restaurants and fast-food outlets but also about foods bought in supermarkets. The introduction of genetically modified foods—immediately dubbed “Frankenfoods”—only adds to the general sense of unease. Finally, the events of September 11, 2001, heightened fears by exposing the vulnerability of food and water supplies to attacks by bioterrorists. How concerned should we be about such problems? Who is responsible for preventing them? Who benefits from ignoring them? Who decides? 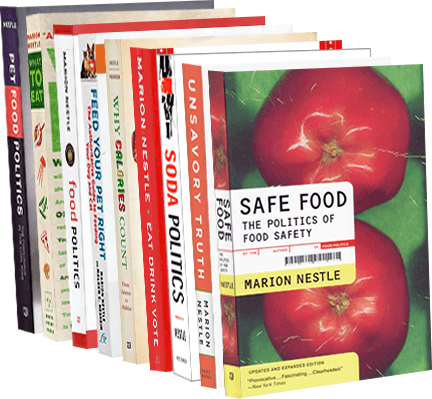 The new edition updates and corrects the previous edition, adds a new Foreword, and changes the subtitle to describe more precisely what the book is about–The Politics of Food Safety. A new Epilogue chapter describes and analyzes what has happened with food biotechnology and microbial food safety since the book first appeared in 2003. It reviews the most prominent outbreaks and recalls of the past few years, and summarizes recent ideas about what to do to fix the system and produce safe food. Marion Nestle, author of the critically acclaimed Food Politics, argues that ensuring safe food involves more than washing hands or cooking food to higher temperatures. It involves politics. When it comes to food safety, billions of dollars are at stake, and industry, government, and consumers collide over issues of values, economics, and political power—and not always in the public interest. Although the debates may appear to be about science, Nestle maintains that they really are about control: Who decides when a food is safe? She demonstrates how powerful food industries oppose safety regulations, deny accountability, and blame consumers when something goes wrong, and how century-old laws for ensuring food safety no longer protect our food supply. Accessible, informed, and even-handed, Safe Food is for anyone who cares how food is produced and wants to know more about the real issues underlying today’s headlines. Marion Nestle’s compelling and accessible book explains what the industrialization of the food supply in this country has done to both the taste and safety of the foods we eat. Marion Nestle has emerged as one of the sanest, most knowledgeable, and independent voices in the current debate over the health and safety of the American food system. All of us who eat should count ourselves lucky to have this indispensable book.